This specification covers pyrometric requirements for thermal processing equipment used for heat treatment. It covers temperature sensors, instrumentation, thermal processing equipment, system accuracy tests, and temperature uniformity surveys. These are necessary to ensure that parts or raw materials are heat treated in accordance with the applicable specification(s). 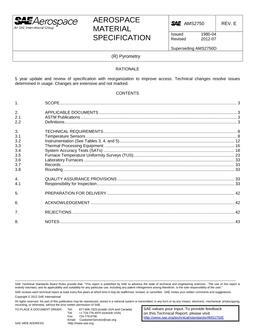 This specification is not applicable to heating, or to intermediate thermal processing unless specifically referenced by a material or process specification.